As we study the Buddhadharma, we must understand the meanings and principles spoken in the Sutras. There are true meanings and principles in every one of the Sutras spoken by the Buddha. All Sutras are related, and so are the principles contained in them. The Buddha expounded the Small Vehicle and the Great Vehicle, and finally, the Buddha Vehicle, which encompasses everything else. The first thing all these vehicles teach is to eradicate bad habits and faults, to get rid of ignorance, afflictions, greed, anger, and delusion. If you can eliminate all of your bad habits and faults, you will naturally be in accord with the Sutra doctrines. But if you don’t get rid of your faults, you won’t be able to understand the principles spoken in the Sutras. We have finished investigating the Fifty Skanda-Demon States and the Four Rules of Purity of the Shurangama Sutra. What is the true principle of this Sutra? Why did the Buddha speak of it? If you find the true principle, you will be able to really understand this Sutra. Otherwise, you can’t be considered to have understood this Sutra. This is just like getting to know a person. In addition to the person’s name, you must find out what he looks like, what he thinks, and how he behaves before you can say you know him. If you only know someone’s name, but don’t know his appearance, his thoughts, and so forth, you can’t say you know him. Studying Sutras is the same. The Shurangama Sutra’s scope is so vast that there’s nothing beyond it, yet so small that there’s nothing within it. The principles of the Shurangama Sutra are like the bones in our bodies. If we had flesh, blood, and skin, but no bones, we wouldn’t look like human beings, and we wouldn’t even be able to stand up. 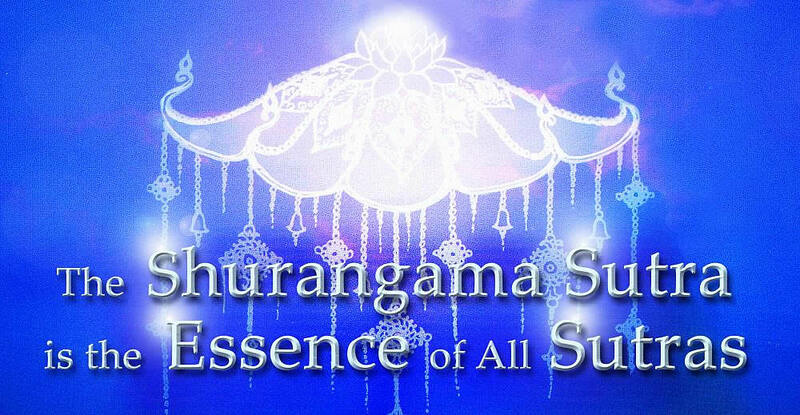 The Shurangama Sutra is the essence of all Sutras. Its function is to destroy what’s perverse and disclose what’s proper—to abolish all evil and reveal the true samadhi. If the Shurangama Sutra disappeared from this world, there would be no Buddhadharma. As long as the Shurangama Sutra exists, the Buddhadharma exists. In order to protect the Buddhadharma, we first need to propagate the Shurangama Sutra. We should be able to recite it from memory, lecture on it, and then cultivate according to it. The City of Ten Thousand Buddhas is the platform of the Shurangama. We should emit the great Shurangama light, cultivate the great Shurangama samadhi, accomplish the great Shurangama wisdom, and perfect the great Shurangama kindness!